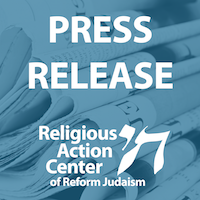 The Reform Movement condemns, with the utmost gravity and disappointment, the President’s decision to exit the historic Paris Climate Agreement. This is an abdication of responsibility to address global climate change and is both physically dangerous and morally reprehensible. The decision disregards vitally important environmental efforts to protect both our planet and the population, with consequences that will reverberate for generations. Reneging on the agreement diminishes U.S. leadership and undermines longstanding alliances, placing an undue burden on other nations to address climate change. Joining with people of faith worldwide, including Pope Francis, the Reform Movement has strongly supported efforts to address the causes and impact of our changing climate. Just last month, we joined 24 partners in the faith community calling on President Trump to remain a signatory to the Paris agreement and to continue to meet our commitments in that agreement. Our commitment to this issue is rooted in our deep concern for vulnerable communities which are disproportionally and unfairly affected by the floods, droughts, famine, disease and displacement brought on by a changing climate. Our rabbinic commentary implores us with a responsibility to steward the earth: “See to it that you do not spoil and destroy my world; for if you do, there will be no one else to repair it” (Midrash Kohelet Rabbah). Climate science demonstrates that the environment is in jeopardy, largely because of human activity. The United States is the second largest polluter in the world. These facts, and the ongoing climate crisis, necessitate bold actions from all nations to change the course of our earth. The President’s decision to exit the Paris Agreement is an affront to our Jewish values and recklessly disregards our global responsibility. We implore the Trump Administration to reverse this decision and advance policies that will provide for meaningful climate solutions, to both adapt to the effects of climate change, and to mitigate its effects for the future.